Thailand never fails to amaze its countless visitors with the most colorful festivities and events sure to delight you with glimpses into the country’s heritage and traditions. 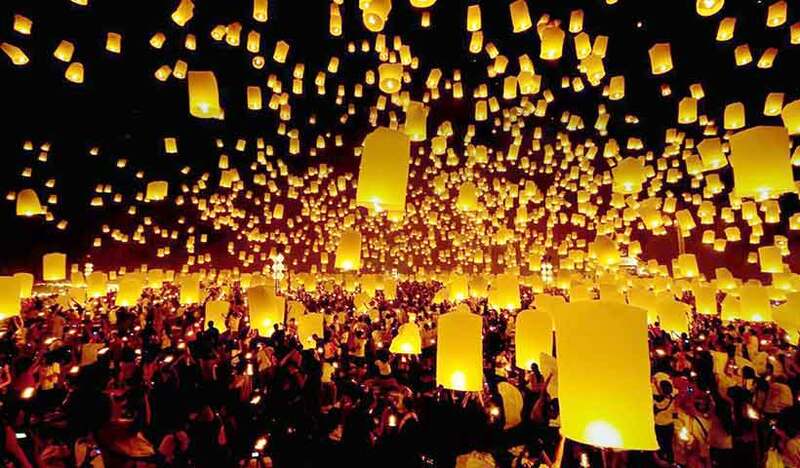 Here’s a listing of the major Thai holidays and festivals you should not miss out! As the most important date in the Thai calendar, the Thai New Year or Songkran is celebrated nationwide though various exciting events. Get ready to be wet during this season, as splashing water is the norm throughout (better to bring your own water gun too)! There’s the Had Yai Midnight Songkran in Songkhla and I San Maha Songkran Festival in Nong Khai, where you can come and splash water and watch a beauty pageant. You can also immerse yourself in traditional Thai culture and join the beautiful Songkran procession during the Ayutthaya Songkran Festival (Old Capital’s Songkran). The Phra Pradaeng Songkran in Phra Pradaeng, Samut Prakarn, is formerly known as the “Pak Lat Songkran Festival”, with the notable addition of a colourful and elaborate Songkran procession staged by the Mon, or Raman, residents of Phra Pradaeng. Chiangmai also celebrates its own Songkran Festival with the same spectacular Songkran procession, culture shows and beauty contest. Enjoy an exciting exhibition on spectacular posters that are available along with the seminars and conferences related to film. Jazz concerts serve to complement the artistic flavor of the series of events. A colorful festival featuring contests, cultural performances, stalls selling traditional paper umbrellas and handicrafts to be found in the main street of Bo Sang. This event is a series of sales fairs organized by community housewives and One Tumbon One Product (OTOP), featuring a fruit-decorated floats on parade, best fruit products showcase and modified fruit product contest. You can relax and enjoy breezy waves of the sound at the Hua Hin Jazz Festival which features both renowned Thai and International Jazz musicians, familiar all-time favorite and contemporary works.